Cut is a measure of brilliance and how well a diamond transmits light. The Cut of a diamond is considered the most important component of a diamond’s beauty. When a diamond is cut properly, light is returned out of the top of the diamond, giving it its brilliance. If a diamond is too shallow, light escapes out of the bottom. 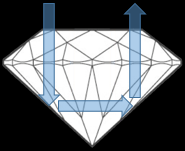 If the cut of the diamond is too deep, light is returned out of the sides. Excellent to Very Good cuts on the GIA Cut Grading Scale reflect nearly all of the light that enters a diamond. These diamonds have the most brilliance. A diamond that has a Good cut reflects most of the light that enters a diamond. Fair to Poor cut diamonds lose most of the light out of the side or bottom from being too shallow or too deep. Learn more about the 4Cs of diamonds: Clarity, Color, and Carat.